Like St Laurence O'Toole "we need a faith where theology and prayer, witness and care of the poor belong together and can influence the world around us and make society more loving" - Archbishop of Dublin. 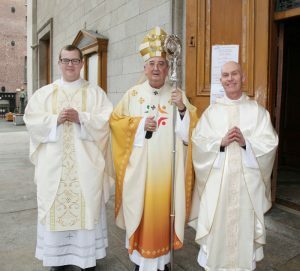 In a joy filled ceremony at the Pro Cathedral, the Archbishop of Dublin, Dr Diarmuid Martin, yesterday ordained two priests for the Archdiocese of Dublin – Bill O’Shaughnessy and James Daly. 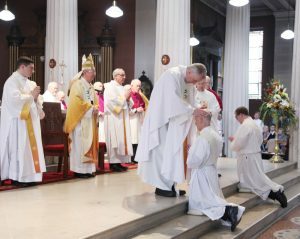 The ordinations took place on the feast of Saint Laurence O’Toole, Principal Patron of the Diocese. By a happy coincidence Bill O’Shaughnessy, hails from Castledermot, Kildare, where the Irish saint was born. Referring to the Gospel of the day in which Jesus asked Peter “Do you love me more than these?” Archbishop Martin told the men that their ministry of witnessing to the love of Jesus would inevitably at times upset their human sensitivity, comfort, and security.”Never allow human upset to impede your love of Jesus,” he said, addressing the men directly. This love involved an absolute allegiance to God over compromising allegiances to success, consumerism, popularity, power or wealth. “Your commitment to poverty, chastity and obedience is not an allegiance of restriction, but an allegiance to be free to love as God loves and will only be authentic if founded in love.” The Church could never be the”closed community of the like-minded” Dr Martin continued. It had to be a dynamic community that could live in any culture and was marked by “Gospel freedom”. Fr Bill O’Shaughnessy comes from Kildare. He studied History and Theology in the Pontifical University Maynooth, and graduated with a BA in Arts in 2009. Two years later he earned a Master’s degree in Dogmatic Theology. In 2012 he entered the seminary. During his studies he spent a year as deacon in Ballyfermot, St Matthew’s Parish. He has now been appointed to Springfield and Jobstown Parishes in Tallaght. Fr James Daly, a native of Cork, worked originally in local government before taking a career break to work in the US as a Youth Minister under a Franciscan Lay Ministry programme. Returning to Ireland he took up studies in Religious Education in Mater Dei. After graduating in 2007, he worked for a year in Great Britain before returning to work in the Dublin Archdiocese. In 2013 he entered the Irish College Seminary in Rome and is now currently serving in the parish of Skerries. The men join 380 diocesan and religious priests of the archdiocese.